"When young women were imprisoned throughout the conflict, in this state, in Britain and in the six counties, they knew they were walking in the footsteps of the women of 1916. We were republicans in the mould of Markievicz. We were what we were. We are what we are. Unashamed, unrepentant republicans; to this day and forever on." I was asked to speak at this event because I am a woman ex-PoW. To my mind there is nothing extraordinary in that, because I am only one of many. There are hundreds of women throughout this country who have endured imprisonment because of their republicanism – and who carry that past with pride. There are women around us today who have shown bravery that would be considered well above the call of duty in any other walk of life. And, there are thousands who have quietly lived their lives and never told anybody of the things they did to further republicanism. And today we’re here to honour the memory of Constance Markievicz, one of the most famous republican women in recent Irish history; a woman revered equally by historians and revisionists, and a woman who believed in, and participated in physical force republicanism. Constance Markievicz didn’t give a second thought to taking up arms and declaring war on the British Empire. Neither had she any misgivings about teaching young Fianna members to fight and bear arms. And she is rightly hailed a hero for taking that stand; but the same people who revere her would, in a heartbeat, condemn me and others like me, and would pour scorn on those women on our republican role of honour, and claim that there is a difference. And I would love those revisionists, who laud Constance Markievicz and condemn Mairéad Farrell, to explain to me the difference between the circumstances that drove republicans in 1916 to strike a blow against the British empire, and of republicans in 1969 and 1970 who took up arms to defend small communities like mine – trapped on the fringes of loyalist east Belfast, subjected to sectarian pogroms, ignored by a British government and forced into a state that neither wanted or accepted us. Where were the revisionists when thousands were being burned out of their homes; when frightened mothers were dragging terrified children onto buses and trains and being forced as refugees across the border, hoping for help and safety in another state that had abandoned us, and that also neither wanted nor accepted us? When those who revere Constance Markievicz’s philanthropy and work among the poor of Dublin are celebrating her life, do you wonder if they ever give a thought to what she would have done had she been there when the hundreds of refugees from ‘the black north’ poured off buses with their meagre belongings in battered suitcases? Do they think she would have stood idly by and did nothing? I know none of us can speak for the dead; none of us know what the other would have done, but we know enough about her to come to our own conclusions; and I would like to think that she would have been as much a leader now as she was then. Her commitment and her legacy was an example to young women like me when I was growing up in a war-torn Belfast. She inspired us. She gave us aspirations to live up. She set an example. And part of that example was to never back down. We knew her history. We knew she took up arms. We knew she was a commander in the IRA. And we aspired to be just like her. She was also a POW, and when young women were imprisoned throughout the conflict, in this State, in Britain and in the six counties, they knew they were walking in the footsteps of the women of 1916. We were republicans in the mould of Markievicz. We were what we were. We are what we are. Unashamed, unrepentant republicans; to this day and forever on. And no political opponent or revisionist will tell me, and all those thousands like me, that I should be ashamed of that. But the irony is, that the people who are so quick to condemn today’s republicans for taking the decisions we did, have never once considered what drove so many Irish men and women, young and old, to walk the hard roads we walked during these last 40 troubled years. We didn’t do for fame or fortune. We did it because it was the right thing to do. There are always reasons and circumstances behind people’s decisions; and, we need as much today to consider those journeys, as we do the journeys of the men and women of 1916. Circumstances and history shaped all of us. That’s undeniable. 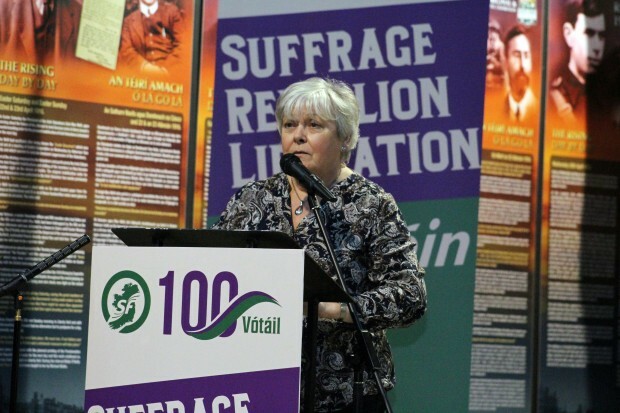 Throughout the decades republican women have been to the forefront of struggles in Ireland; in the Suffragette movement, the Labour movements, the Gaelic League, and many other organisations – much as republican women today are deeply involved in every aspect of daily life and organisations working to better peoples’ lives. In every phase of the struggle, women have taken risks. From their involvement in the 1950’s border campaign, to those who broke the Falls Curfew and carried guns and ammunition out under their coats, in prams and in shopping bags. And, we know many too who lost their loved ones, and their own lives, to plastic, rubber and live bullets; on active service for the IRA, and to loyalist and British State murder squads. We all know women who walked the streets wrapped in blankets, in bare feet, in rain and snow, to highlight the plight of the prisoners in the H-Blocks and Armagh; who smuggled comms, love letters, and much more into and out of the prisons; who marched in their hundreds to the steps of Stormont when Sinn Féin were locked out of talks, demanding their rights and representation. There are women who travelled every week, for years, to visit loved ones imprisoned in this state, in the six counties and in Britain, most times with young children in tow. The hardship of prisoners’ families is often forgotten, and imprisonment impacted on thousands upon thousands of people throughout this island, not just the prisoners themselves. Brave republican women stood as Sinn Féin candidates in the early ‘80’s and 90’s, when in councils throughout the six counties they were vilified and subjected to the vilest of sectarian abuse and threats of death. And I’m proud to say that the temerity of those who led the way has paid off in dividends. Republican women were elected in their hundreds – councillors, MLAs, TDs, MEPs, Senators and including – dare I say it – three very proud and very capable women MPs are walking in the footsteps of the first female MP elected to sit in the British House of Commons; the first abstentionist Sinn Féin MP, Countess Constance Markievicz. And still, there are people telling us today that our Sinn Féin MPs, elected by thousands of Irish citizens full in the knowledge that, like Markievicz they would not be taking seats or swearing an oath to a foreign government, should take seats in a British parliament, or better still, resign those seats and gift them to others who are more than willing to doff their caps and swear an oath to defend an English monarch. These same people, who are lecturing us, will no doubt be lauding Constance Markievicz for her part in the birth of the nation, with all her history of abstentionism and of physical force republicanism. Do they genuinely not understand irony? And do they think that our supporters, those who flock to the ballot boxes in their thousands to return Sinn Féin elected representatives, don’t aspire to the goal of Markievicz, of a democratic republic that cherishes all of the children of the nation equally? Where is the equality for nationalists in the six counties? Where is the respect for the democratic mandate of thousands upon thousands of people who have yet to have their rights and entitlements respected in the British constructed and maintained sectarian six-county state? Where is the support for our democratic mandate? Where is the aspiration to cherish all of the children of the nation equally? Or do they not consider us part of that nation? They need to bear in mind that when the Proclamation was being written there was no border in Ireland – hard or soft. They also need to bear in mind that there is no single narrative to this conflict. Yes, people have been hurt, on both sides, and those who are trying to revise the history of the IRA of 1916, are also trying to revise the history of the IRA of this phase of the struggle; to present one side and one side only. As a republican woman I am proud of the rich history of Irish women that we can lay claim to, and many here today were part of that history. And I am proud and in awe of those women who lost their lives as part of that struggle. Unfortunately, throughout the decades of our troubled past people who know nothing about what we went through are writing and rewriting our history. We cannot allow the memories of our dead, the stories of nationalist and republican victims, and the history of repression and oppression that led to young people again taking up arms, in the same way Constance Markievicz and Tom Clarke and Pádraig Pearse and all those others in 1916 took up arms, being airbrushed out of our history. And maybe one day we’ll be in a place where the circumstances that led to those decisions are acknowledged and accepted. Because, rest assured, not one of us woke up one morning and decided on a whim to take up arms, to put our lives on the line, to face imprisonment and death. There are always reasons why people make the decisions they do; but some people just refuse to see or accept that. We know those reasons; and we need no lectures from people who have not walked in our shoes. Until then, let’s agree to accept that equality and rights hurt no-one, and to agree that what Constance Markievicz strived for, the desire to “cherish all of the children of the nation equally” is something we should all aspire to. We have a duty to future generations to ensure that our revolution isn’t rewritten. We need to make sure that our young people know why and where our history of struggle comes from; to remind, educate and to see that it never happens again; to ensure that young women continue to be inspired by Constance Markievicz, by her bravery, her philanthropy and her work for those less well off. But we also need to ensure that the circumstances that led to her and future republican women seeing the need to take up arms, never happens again.